This Saturday The Tripping Point builds activism for sidewalks and complete streets in L.A. On Sunday, CicLAvia opens streets in Atwater Village and Glendale. Plenty more going on all week. 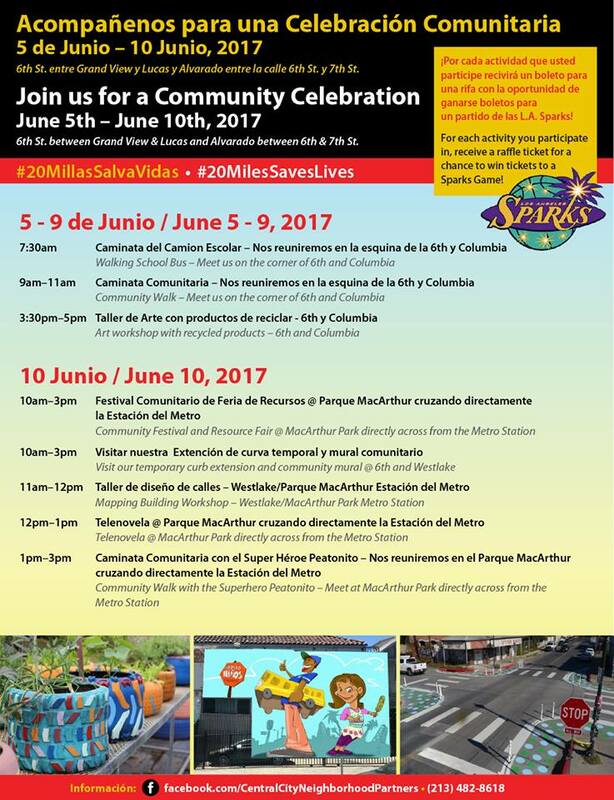 Monday 6/5 through Saturday 6/10 – Central City Neighborhood Partners host 20 Miles Saves Lives, a Vision Zero activation event. Details at Facebook event. Tuesday 6/6 – The Southern California Association of Governments Toolbox Tuesdays hosts a free webinar on Using GreenTRIP Connect to Gain Community Support and Win Cap and Trade Funding for Transit Oriented Developments. GreenTRIP Connect is a free statewide tool that forecasts greenhouse gas and traffic reductions, parking savings and other features on a parcel by parcel basis depending on proposed project specifications. The webinar takes place from 1 to 2:30 p.m. Register at Wufoo. Tuesday 6/6 – The L.A. City Council Planning and Land Use Management “PLUM” Committee will vote on implementation of new linkage fee tying development to affordable housing. The PLUM meeting gets underway at 2:30 p.m. at the Public Works room 350 at L.A. City Hall at 200 N. Spring Street (public entrance on Main Street) in downtown L.A. Details at meeting agenda. Tuesday 6/6 – The city of L.A.’s appointed Bicycle Advisory Committee will meet at 7:00 p.m. at Hollywood Neighborhood City Hall at 6501 Fountain Avenue in Hollywood. Details at meeting agenda. Starting Thursday 6/8 – The Los Angeles Poverty Department hosts “The Back 9: Golf and Zoning Policy in Los Angeles” a multidisciplinary art project responding to the re-zoning of Los Angeles. Performances take place at 8pm on June 8, 9, 10, and 16, plus a 3pm matinee on Jun 17. The project includes a miniature golf course installation which will be open and playable by the public from 2 to 5 p.m. starting Saturday, June 10, and open Thursday-Saturday through October 31. The Back 9 takes place at the Skid Row History Museum & Archive at 250 S. Broadway in downtown L.A. Details at LAPD website. Thursday 6/8 – L.A. City Councilmembers Curren Price and Marqueece Harris-Dawson and the Los Angeles Department of Transportation host the fourth and final Vision Zero open house meeting for South and Southeast Los Angeles. This week’s meeting will be at the Mark Ridley-Thomas Constituent Service Center at 8475 S. Vermont Avenue in South Los Angeles. The format will be open house, so interested people can drop by anytime from 6-8 p.m. Additional details at LACBC. Saturday 6/10 – Investing in Place and others host The Tripping Point: Advocacy Summit for Completing Streets in L.A. taking place from 9:30 a.m. to 2:30 p.m. at Puente Learning Center at 501 South Boyle Avenue in Boyle Heights. Participants will learn how to advocate for systemic change to transportation and mobility infrastructure in L.A., including sidewalks, curb ramps, crosswalks, street trees, and bus stops. The conference is free, but preregistration is requested. Register now at splashthat. Share via Facebook event. Sunday 6/11 – For the first time ever, CicLAvia open streets festival will touch down in the city of Glendale, and the L.A. neighborhood of Atwater Village. Open streets are free, fun, family-friendly festivals that close streets to car traffic, opening them to walking, bicycling, skating, running, and other safe human-scale activity. CicLAvia Glendale Meets Atwater Village will take place from 9 a.m. to 4 p.m. 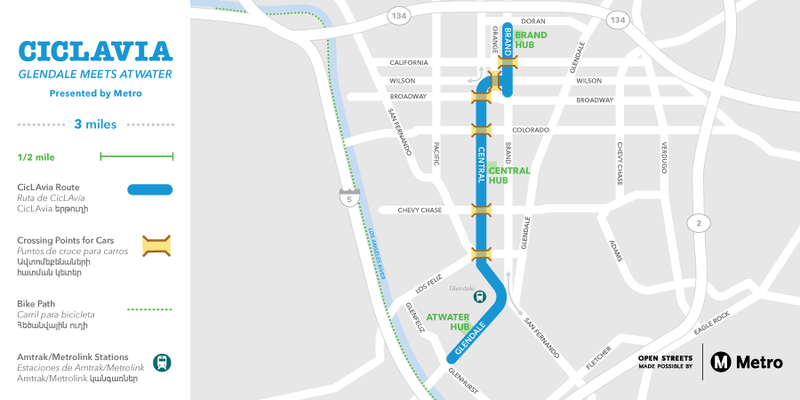 The 3-mile long route is not among CicLAvia’s most transit-accessible, but is very near the Glendale Metrolink/Amtrak station and easy bicycling distance from the L.A. River Bike Path. There will be feeder bike rides from Eagle Rock/Highland Park, Mid-City West, and Burbank. This Sunday is the L.A. County Bicycle Coalition's annual L.A. River Ride. Attend meetings on Vision Zero for South L.A., Bogotá Colombia, and North Westlake's walkability plans. Bike to see NELA murals, and much more all this week. CicLAvia opened streets in Glendale and Atwater Village yesterday! Saturday will be EYCEJ's Toxic Tour bicycling along the southeast stretches of the L.A. River. Plenty of meetings to support safety improvements, affordable housing, and open streets. Metro committees and much more. CicLAvia, AD51 election, Bicycle Advisory Committee, Orange Line webinar, and LACBC Open House.